Former cricketer Shane Warne has written an open letter to tennis player Nick Kyrgios, telling his fellow Australian not to waste his talent. Kyrgios, 20, said on Tuesday he has learned to keep his mouth shut after he was fined and given a suspended ban for remarks he made about opponent Stan Wawrinka's girlfriend last month. Warne, 45, told Kyrgios "respect is more important than being liked". He added: "You're testing our patience mate, show us what you're made of." Kyrgios was given a suspended 28-day ban and fined AU$35,000 ($25,000; £16,200) by the Association of Tennis Professionals (ATP), to be imposed should he transgress again. Warne, Australia's record wicket-taker, wrote: "Please don't waste your talent, everyone in the world, especially Australians wants to respect you. "No shame in losing, but show us you will never give up, that you will give it everything to be the best you can be." 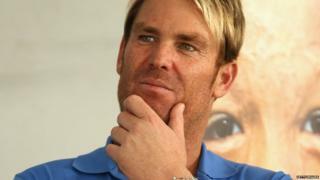 Warne's letter received a mixed response, with some users online agreeing with him while others accused the cricketer of seeking attention. Kyrgios's punishment only applies to ATP events, so was not in effect at this week's US Open. The world number 37 was well received by the crowd at Flushing Meadows as he was beaten by Britain's Andy Murray in the first round. He said he understood "100%" why some spectators had jeered him at previous matches. "I don't think any of us... were perfect at 20," Kyrgios said. Image caption "I'd like to think that I'm going to learn from it. I think I have. I think I'm on the right path," said Kyrgios.